I recently purchased a Moai through Matter Hackers. The build went well. However, I have been unable to get through any test prints. Take a short video of the behavior and link to it here. If you power cycle the printer does it act normally until you start another print? Pull the SD card reader and look at the solder connections on the pins. Post a picture if you are not sure what to look for. Contact Matter Hackers about this issue also. I have already replaced one SD card sent to me by Matter Hackers, this has been the behavior of the Moai since I received it. Have you considered reinstalling the firmware? Be sure to follow the update guide precisely and Format the SD card – a very important step. can you post the video link? 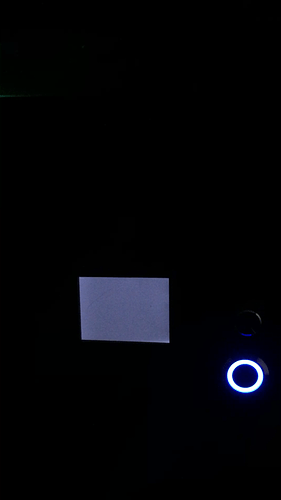 This white screen thing also happened to me two hours into the print - laser still running - Have opened a separate topic on it because I do not believe it is the SD card reader - That simply does not make sense. I have borrowed your image - Hope that is okay, my phone is misbehaving so could not get a picture. Hope you get it resolved! "If the SD card Board is fine you most likely need a new mainboard. Mine did that, after a few hours the screen would turn blank, printer still worked fine and finished the print."